It's been a while, but there have been updates. Balloting is underway. If you haven't gotten a ballot by October 15, email Dan Henderson at the ARRL - dhenderson@arrl.org. Remember, if you joined by September 10, live in any of the five contested divisions (Hudson, Central, New England, Northwestern, Roanoake) and have a valid license that allows you to operate in the USA - it does not have to be an FCC issued license, but must be valid for reciprocal operation in the USA (by-law 1(a)) you are a full ARRL member and can vote. Support for me has been very, very strong. I have had a full email inbox for a week and more since the ballots started hitting mailbox. Many of these are also first time voters, and many of those first time voters have been ARRL members for many years. I attribute this to having a strong campaign ethic, a powerful message and a detailed platform with a real vision for ham radio's future. On August 19, at the invitation of John, W2HCB, President of The Great South Bay Amateur Radio Club (GSBARC) and EC/RO for the town of Babylon, NY, I visited the Fire Island Lighthouse to help them activate the lighthouse for International Lighthouse Lightship Weekend (ILLW). They have been an amazing and active club for many, many years and I was all too happy to visit. The lighthouse itself is an amazingly pretty sight to see with some of the most beautiful and absolutely pristine seashore in this area. I took a tour of the lighthouse, and climbed all the way to the top. I also met up with two of my YL friends - Caryn, KD2GUT and Salli, K2RYD. I operated SSB and CW and many were happy to work me. GSBARC absolutely rolled out the red carpet. They met me, shuttled me to the light from Robert Moses Field, and even gave me a personal tour of the lighthouse. This week I received a note from Dan Henderson, N1ND, assistant secretary of the ARRL, saying that my petition was approved by the Ethics and Elections Committee. This is great news! It’s the first hurdle. Second of course is the actual election. Much work still to be done, but I’ve kicked campaign mode into high gear. I have a very packed calendar with tons of club speaking engagements, and other campaign activities. I sometimes bring my kids to tour with me, and they enjoy seeing the sights. I’m working on their licenses, one day at a time. They do enjoy tuning across and listening. They’ve said hello to my regulars on 40 and 80 and on the local repeaters. I would like to thank everyone who signed on, and even if you didn’t get the chance, not to worry - the real important thing is to remember to vote. Greetings, Hudson Division election fans! I have several new things to report. As I write this, I am enjoying a wonderful FT8 opening to Europe on 6 metres. But even bigger than that, my friend Joe Taylor, K1JT has graciously offered his endorsement. Joe says, "I would be pleased to offer my endorsement - and I am delighted that you are running." This is no accident, folks. 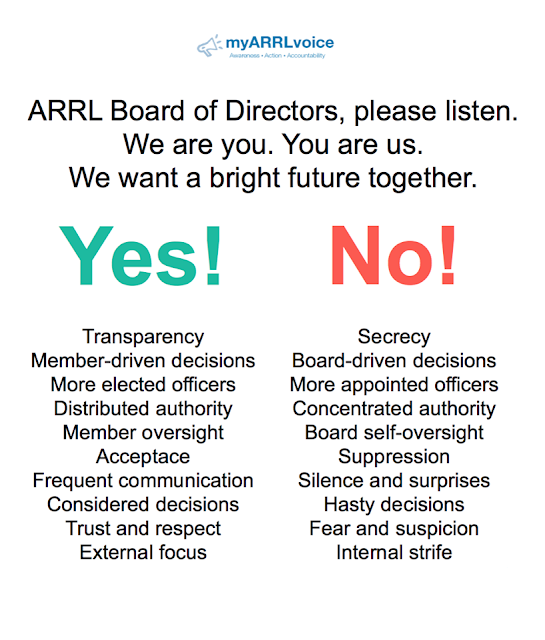 There are many who realize the direction that ARRL needs to go. We do need to focus on transparency, accountability and sound governance. We need to bring back ARRL fully to member service and member involvement. Joe joins a rapidly growing list of people who are behind me. I've also been endorsed by Frank Fallon, N2FF, who was the director until 2011 when he retired. Frank has offered much help and support. I am really thrilled that Frank has come on board to help, as his knowledge and experience is invaluable. 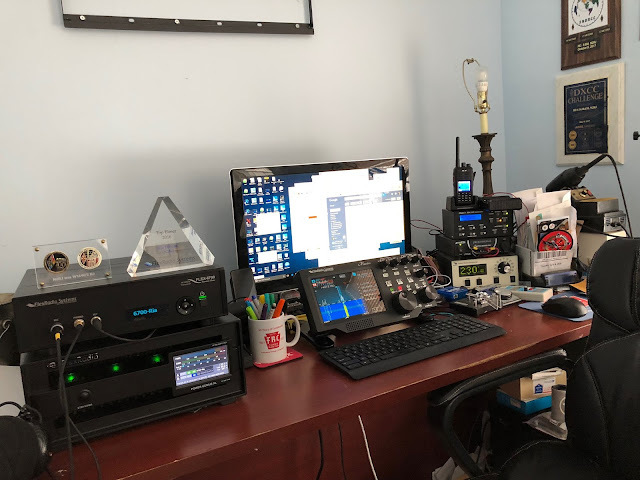 Reminder: I'll be at the Sussex County Amateur Radio Club Hamfest this weekend, on Sunday July 15. I have a table inside and you should see the banner. Come by, say hello, and bring your friends. I'll also be there on July 14 helping the club set up (I am a member). Banner ads are now running on QRZ.com and soon to appear on some other websites. This targeted campaign will hopefully bring more awareness of the campaign. Ads aren't cheap, but they are definitely worth it. They are especially worth it if you would like to win back your Director's seat in the Hudson Division. So a big welcome to all of you. And please, tell your friends in the Hudson Division why we need this positive change. Of course, if you'd like to help display more ads and get the word out even more, you can easily do so. 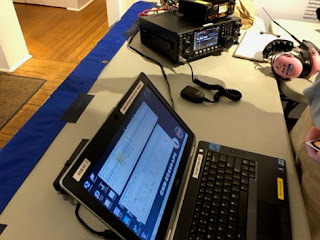 Sunday 7/1 I had the pleasure of visiting a small hamfest up in White Plains, NY. It was the Metro 70 hamfest run by Metro 70 network. It was a pretty small, low-key event. ARRL was there with the ENY SM - John, K2QY and his wife Linda, K2QYL N2YBB was also there at the ARRL table. Nomar, NP4H was there with me to help with the table and it was nice having the company. I also remotely made FT8 contacts in between talking to people. Quite a few members of WECA were there and we chatted for a good bit. I am speaking at their club meeting in September. Quite a number of others were there and had various things to talk about. It is clear that the campaign is gaining serious momentum as we prepare for positive change in Newington. On July 3rd I will be at the Kings County Radio Club (KCRC) meeting in Brooklyn, should be fun. At long last the next release of SmartSDR 2.x is here. As you may remember, Flex had released SmartSDR 2.0 in Summer 2017. This made the Flex-6000 series the first ever amateur radio transceiver platform that can become an internet remote base out of the box. Other systems have had remote capability but Flex was the first to do it without having to add firewall rules (for most people) and incorporated modern technologies like social login and multi factor authentication (MFA) for enhanced security. The backend for authentication is powered by Auth0, one of the leaders in the industry. ARRL CEO Tom Gallagher to retire, cites tax laws as reason. I found it somewhat surprising, since President Rick Roderick, K5UR recently dug in his heels when it came to league governance, citing a "misinformation campaign" which was really nothing more than members becoming rightly concerned about the move toward less transparency and the dilution of their vote. Gallagher has often been subject to much criticism, and many have cited his leadership as part of the reason that the league is in such turmoil with membership lately. I am trying to keep neutral on this, and personally I do not know if he was directly responsible, but it would seem to me that all of these new moves toward reshaping the league started on his watch. So this is either a great coincidence or he is the one responsible. As with all things, sometimes you have to reinvent yourself. So, as of today, this blog will be known as "Ria's Shack." I've been contemplating this change for a long time now, and much of it has to do with my plans for other amateur radio ventures to help every one of you become better at our esteemed hobby. This especially includes my YouTube channel which I plan to add more meaningful content to. So, here's to the new and improved blog - henceforth known as "Ria's Shack"
FlexRadio It's no secret that I'm 100% a FlexRadio fan. This is not without good reason. 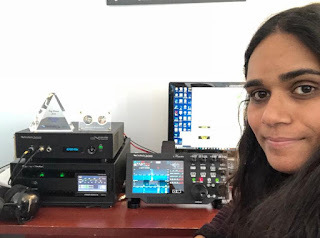 Ever since I learned about amateur radio I have dreamed about a radio with the capabilities that they have made a reality. As such I have spent a lot of time on their community forum and privately advising their users and prospective users about capabilities of the radio and ecosystem. I have also helped many users get on their radios remotely, not just with the new SmartLink capability in SmartSDR 2.0, but also with VPN access using Raspberry Pi. Flex decided to honor me with one of their customer awards which brings me immense pride, and has earned a prime spot in my shack.